Be bored and see where it takes you, because the imagination’s dusty wilderness is worth crossing if you want to sculpt your soul. I’m having so much fun drawing and painting from nature. Animals and flowers are equally beautiful in their own ways, for different reasons, but again, if you want a whole new appreciation for a favorite animal, try drawing him or her. I promise you’ll never look at your friend the same way again. Happy Spring Tuesday, everyone. Open your eyes and look at something in a different light today. See where it takes you. Peace. Love purple and orange together! Thank you! It’s supposed to be blue lol. I’ll have to take another look, I guess the screen is giving it a purple tint! Wow, it does look purplish!! It looks blue too. Whatever the case I love the striking difference in colors and how it makes the cat silhouette stand out boldly. Haha, thanks! I was going for the complementary colors, it was supposed to be lighter… I was just checking out your cardinal video, so cute!!!! I’m amazed at how close you guys are to it!!! As George would say, it’s not you, it’s me lol. We got back in from out of town yesterday and now it’s “back to reality” lol. Ughie. No worries. Half the time, it comes out nothing like I planned, especially with watercolor. I always have a vision of A and get B instead. I’m happy with the way the silhouette turned out though. There was a day I wouldn’t have been able to draw this at all! Not without many hours and tears lol. Costanza! How could I not realize?!?!! Happy day Laura! I’m sprinkled and splattered – thanks! Lovely quote and I love the shape of that cat and colors…well done! Nice! And I like your quote about being bored too. Many years ago in art school the students (myself included) were complaining about being bored with drawing cardboard boxes day after day for weeks. Our teacher said the goal was to draw them until we no longer found them boring. I now so get that and incorporate that view in my life and art today. Thanks! What a great perspective there, Nancy. Great shadow cat. Mets colors on purpose? I see a blue cat, not purple, of course! I originally thought orange and black (big shocker there), then decided to go with the complementary colors. Go Mets! Love, love, love, love, love, love, love, love! This is super! 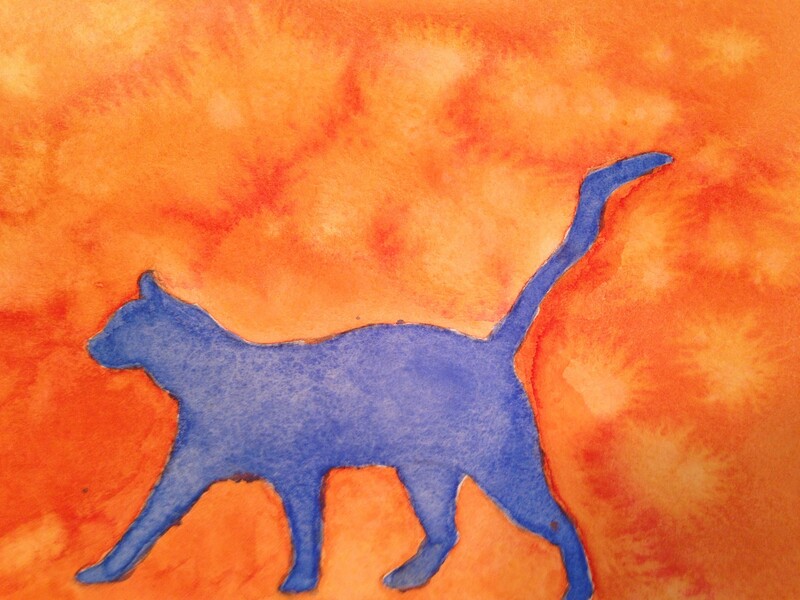 Popping colours, nice texture in the orange, love the cat pose. Fab. Thanks very much, Rebecca! I appreciate your comments and visits. I’m often surprised at the difference between what I envision in a watercolor piece and the final result. In this case, I was pleased at the difference. They’re the best – when they work out lol! Thanks so much, Ruth! This time, Plan B was definitely better, at least in my opinion. Thanks as always for your comments and encouragement. I love the texture in the background, and the colour really makes the cat stand out. Wow, how beautiful!!! Wonderful colors! Love it that the color of the cat is even and the background is “sparkling” somehow! Way to go, Laura!!! A happy accident. Thanks, Ann! this is striking! you are always mixing it up!!! love it!! I love the movement and electric colors in this painting!